Modern embedded designs often include dozens of converters with widely varying requirements. Rohde & Schwarz oscilloscopes and probing solutions offer the capabilities needed to test all aspects of embedded power supplies. Embedded power supplies combine traditional power supply components with multiple sensors, processing and control logic, and digital communications interfaces. Test equipment for debugging requires isolated input channels for measuring hazardous voltages. Additional digital channels support the analysis of digital signals, while trigger and decode capabilities are essential for time-correlated monitoring of serial, protocol-based communications interfaces. Measuring the switch-on/switch-off behavior of the numerous power voltages in modern CPUs or FPGAs is challenging. The different supply voltages must be applied with specific time delays ranging from a few nanoseconds to several milliseconds depending on the specific device. In addition, each voltage has recommended minimum and maximum ramp-up times that range from a few microseconds to several milliseconds. Consequently, slew rates range from a few V/µs to several V/ms. During ramp-up, the difference between particular voltages should not exceed defined values. Modern capacitive touchscreens used in mobile devices are susceptible to common mode noise generated by external power supplies. Measuring and characterizing the common-mode noise of exernal power supplies in line with well-defined standards is therefore essential and ensures flawless operation of handheld devices with capacitive touch displays. Many portable electronics use a buck-type DC/DC converter to generate the different supply voltages for CPUs, analog components or display and LED drivers. This application note evaluates the main dynamic behaviors of DC/DC buck converters. The test procedures and measurements described determine whether the converter operates in a safe manner, and whether it meets its design goals for startup time, inrush current, peak inductor current, inductor behavior, output ripple and ripple spectrum. The R&S®RT-ZVC is a multi-channel oscilloscope probe that provides up to four voltage and four current channels for high dynamic range current and voltage measurements. Each channel has 18-bit ADC resolution at 5 Msample/s and 1 MHz bandwidth. With up to two R&S®RT-ZVC probes supported on a 4-channel R&S®RTE or R&S®RTO oscilloscope, up to 20 voltages can be analyzed in parallel. Offering bandwidths from 600 MHz to 6 GHz, R&S®RTO2000 oscilloscopes excel at both time domain and frequency domain testing. Thanks to excellent signal fidelity, responsiveness of 1 million waveforms/s and up to 16-bit vertical resolution, you can measure quickly with confidence. 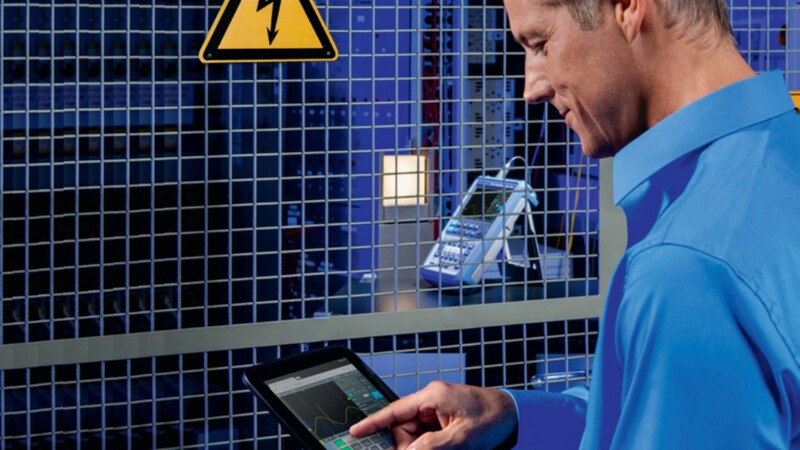 The capacitive touchscreen with SmartGrid makes this oscilloscope easy and intuitive use. R&S®HMP power supplies offer high efficiency with low residual ripple and many protection functions. With two, three or four output channels and up to 10 A output current per channel, they are tailored for use in labs and test systems. R&S®Scope Rider offers the performance and capabilities of a lab oscilloscope with the form factor and ruggedness of a battery-operated handheld device. Isolated channels combined with 500 MHz bandwidth make it a perfect choice for power electronics applications. R&S®RTE1000 oscilloscopes offer a fully integrated multi-domain test solution with time, frequency, protocol and logic analysis functions. From embedded design development to power electronics analysis to general debugging, the R&S®RTE1000 handles everyday T&M challenges quickly, accurately and easily.